Our programs will raise your child’s confidence and self esteem to new heights. KICK-ROBICS is great kickboxing class for beginner or advanced students. It’s the most complete cardio workout, and, the atmosphere is comfortable, fun and positively charged. The Combat Objective Battle Ready Applications or C.O.B.R.A. self-defense program is designed to be highly effective in real world situations where your survival is on the line. 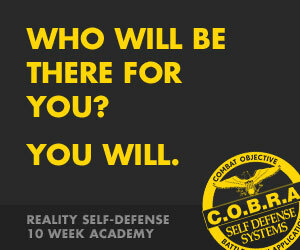 It’s an empowering program for those who desire to learn real world self defense.